Sriracha Baked Tofu Brown Rice Bowls - Like a Vegan Poke Bowl! Sriracha Baked Tofu Brown Rice Bowls - Like a Vegan Poke Bowl! 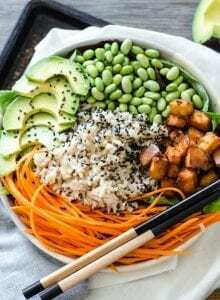 These delicious and healthy Sriracha Baked Tofu Brown Rice Bowls are a vegan take on Poke bowls. They’re easy to make, customizable with your favourite whole grain and veggie swaps and the ingredients can be made ahead of time if you have a busy week ahead. Try them topped off with the quick and yummy sauce. Cut tofu into small cubes and toss with sriracha, soy sauce and garlic powder. Place on a baking sheet lined with parchment paper or a silicone baking mat. Bake for 20 minutes, flip and bake another 15 minutes until golden brown and crispy. Whisk all the sauce ingredients together in a small dish. Store any extra in the fridge for up to 3 days. Start with a handful of greens in each bowl. Add brown rice, edamame, julienned or grated carrot, avocado and the baked tofu. Top with a drizzle of the dressing (or another sauce of choice) and black sesame seeds. Other optional toppings: chopped fresh mango, pineapple, mandarin wedges, dried wakame or kelp granules, kimchi, pickled red cabbage, pickled ginger, cilantro, green onion.